Retired 2003 from full time working for UNIFI. 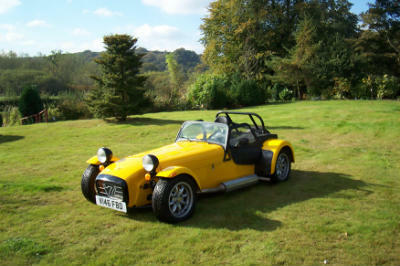 Peter has treated himself to a very nice yellow Caterham 7 sports car - called 'The Yellow Peril'. Peter is a keen Scouter and is always working on some project. Initially trained as a jewellery designer and gemmologist and then running her own large playgroup. Finally retraining as a teacher. Julie retired from any form of teaching in 1995. Julie is passionate about narrow boats. A distinguished scientist and Fellow of the Royal Society. Prof. Gaydon made his mark in flame spectroscopy. He had two children Julie and Bernard. Widowed in 1981 after 40 years of happy marriage. In 1998 A.G.G. had a serious heart problem but continued to enjoy life, particularly nature, until he passed away on April 16th 2004 - He will be greatly missed by all his family. Information and speeches from his funeral can be found here. Tania is a Clincal Psychologist and lives beside the canal at Bulbourne, Tring. Harley was born 2004 and his brother Torin in 2007. A freelance graphic artist and generally very creative person. Melanie is engaged to Martin. Mel loves style. Living in Kingston she loves to socialise. One of Mel's currently freelances at JWT one of Londons' biggest agencies. Mel worked on props for the latest Batman film! Married since they were in their teens (1992) and now living in New Malden. Both are committed Christians and involved in Kings Church, Kingston. Joshua was born in 2004 and Bethany 2006. Gordon works in websites for Church123.com Katie is a full-time mum and is involved in lots of local groups.